Savory, spicy, and a smorgasbord of textures, Korean cuisine is something everyone should try once in their lives. To help you bring a taste of Korean flavors into your own home, we rounded up several classic recipes that even beginner chefs can tackle. They don't require a mastery of complex techniques nor access to specialty markets — simply an appetite! From kimchi fried rice and bulgogi (marinated beef) to candied sweet potato and pan-fried tteokbokki (spicy rice cakes), here are the Korean recipes you should try this week. What is it? Fried, candied sweet potato slices. The star of this side dish is Korean sweet potato, which is denser than American sweet potatoes and have purple skin and a more yellow flesh. Using just three more ingredients, you can transform it into a delicious sweet snack you won't want to stop eating. What is it? Corn topped with melted cheese, and sometimes rice cakes (those aren't mini marshmallows, people 😂). No night out in Seoul is complete without a shared platter of corn cheese. Make it yourself at home for a hearty snack or as a potluck appetizer. What is it? A bowl composed of rice, beef, egg, and veggies. This classic dish uses rice as a base and tops it with various veggies and savory steak. The key ingredient is really the spicy gochujang sauce, which is at once savory and spicy, and brings all the flavors together. What is it? A clear soup made with a whole chicken. This soothing, chicken soup uses an entire chicken and gets extra layers of flavor through abundant additions of ginger, garlic, and onion. What is it? 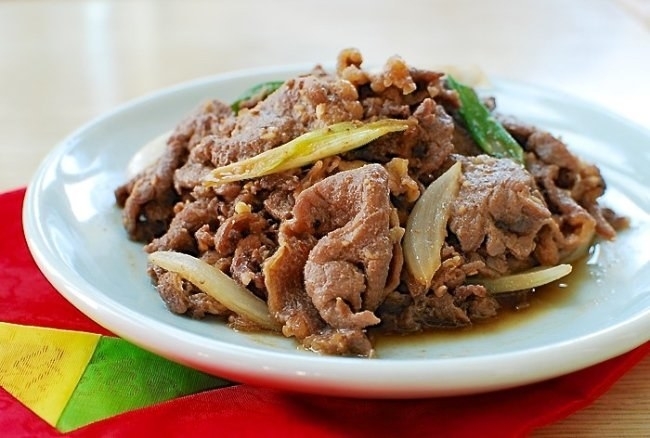 Sweet, marinated beef usually cooked with sliced onions and carrots. This is one of the most popular Korean dishes, and it's pretty straightforward to make. 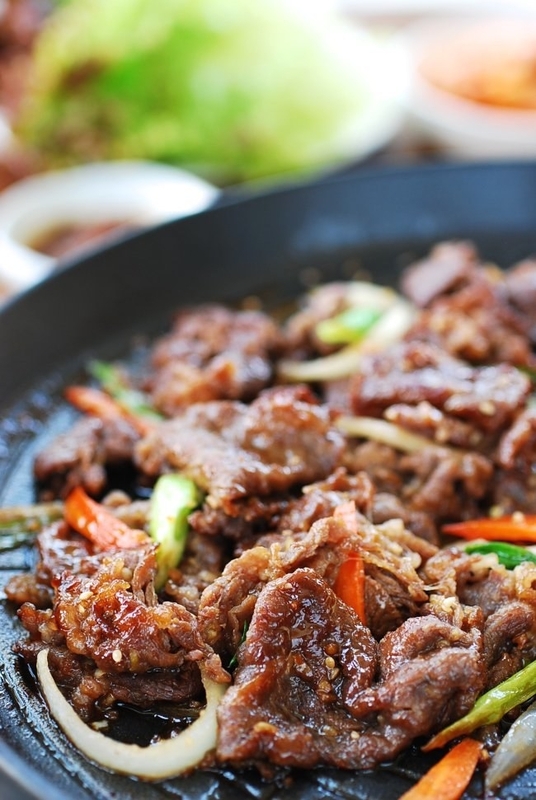 You don't even have to have access to a specialty Asian market to make bulgogi. Just grab some top sirloin or beef rib eye, stick in the freezer for an hour to firm it up, and slice it into thin bulgogi strips before you start cooking. What is it? BBQ chicken. While bulgogi often refers to beef or pork meat, this chicken variation is marinated with the same sweet, savory sauce and is just as succulent. What is it? Sliced vegetables fried in Korean frying batter mix. The key to extra crispy tempura is to use Korean frying batter mix (which you can make yourself if you can't find any at your local grocery store), in addition to ice cold water in the batter. What is it? A savory pancake made with seafood and sliced scallions. Pajeon is one of the most popular Korean appetizer dishes, often enjoyed before meals or as bar food. With just one other side dish or a heartier portion, you can easily have it as a meal in itself. What is it? Sweet and savory braised chicken. Just throw all your ingredients into a slow cooker for a sweet, tender, and moist chicken dish you can enjoy by itself or with a side of rice or salad. What is it? Fried rice made with kimchi and a fried egg. Just a few ingredients — like bacon, sesame oil, and sesame seeds — elevate this simple fried rice dish into a bookmark-worthy meal. What is it? Tangy, spicy, sweet salad topped with pan-fried dumplings. This recipe uses store-bought dumplings, so you have no excuse to not try this non-salad salad which you can easily whip up on a weeknight. What is it? Sweet potato noodles topped with shiitake mushrooms and other veggies. And if you can't find japchae noodles at your local grocery, you can always snag a pack from Amazon for $6. To find other brands, simply search for "sweet potato noodles" or "japchae noodles." What is it? Spicy, crunchy cucumber slices. Typically enjoyed as a "banchan," or side dish, along with rice and meat. What is it? Pan-fried rice cakes tossed in a sweet and spicy sauce. One could say that rice cakes are as prevalent in Korean cuisine as pasta is in Italian cuisine. And like pasta, tteokbokki is best enjoyed slightly al dente and not overcooked and overly soft.